1. Introduction Rodney Evinsson, Tor Jacobson and Daniel Waldenstrom; 2. Central banks: evolution and innovation in historical perspective Michael D. Bordo and Pierre L. Siklos; 3. 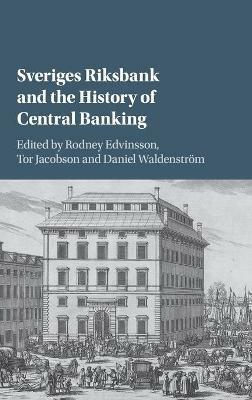 Sveriges Riksbank: 350 years in the making Klas Fregert; 4. The Bank of England, 1694-2017 C. A. E. Goodhart; 5. The Bank of Spain, 1782-2017. A history Pablo Martin-Acena; 6. The other way: a narrative history of the Bank of France Vincent Bignon and Marc Flandreau; 7. Four hundred years of central banking in the Netherlands, 1609-2016 Gerarda Westerhuis and Jan Luiten van Zanden; 8. Norges Bank 1816-2016. A history of a small independent central bank Oyvind Eitrheim and Jan Tore Klovland; 9. The Bank of Italy, a short history, 1893-1998 Gianni Toniolo; 10. A history of the Bank of Japan, 1882-2016 Masato Shizume; 11. The two eras of central banking in the United States Barry Eichengreen; 12. The struggle of German central banks to maintain price stability Jakob de Haan; 13. The People's Bank of China: from 1948 to 2016 Franklin Allen, Xian Gu and Jun Qian; 14. The European Central Bank Otmar Issing. Rodney Edvinsson is Associate Professor and Senior Lecturer in Economic History at the Stockholms Universitet, where he also received his Ph.D., in 2005. He is also Pro Futura Fellow at the Swedish Collegium of Advanced Study. His main research interests include long-term economic growth, historical national accounts and monetary history. Tor Jacobson is an economist with the central bank of Sweden, Sveriges Riksbank. He received a Ph.D. in statistics at Uppsala Universitet, Sweden. Tor Jacobson's research interests include econometrics, empirical macro, banking, and empirical micro applications. Daniel Waldenstroem is a professor of economics at the Research Institute of Industrial Economics, IFN, and visiting professor at the Paris School of Economics. He received a Ph.D. in economics from the Stockholm School of Economics and a Ph.D. in economic history from Lunds Universitet.